LCP guide rods in stock. -Made from 17-4 H1150 Stainless Steel, the perfect combination of toughness and hardness. 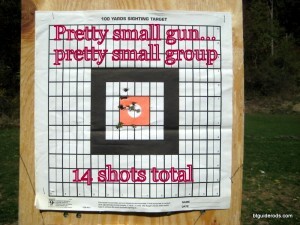 Resists spring scoring and gouging without being hard enough to damage anything in the gun. 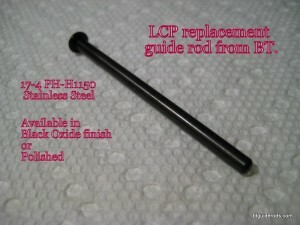 -Works with factory springs and Wolff springs. -Available in black oxide or polished finish. BT was originally contacted about this because the factory guide rod head appears to peen after minimal usage. Ruger claims that this has never caused a function problem but many people wanted a replacement part that would retain its shape over the lifespan of the gun. It is important to realize that simply making the same dimensions in a harder material would likely create more problems. If the guide rod was made so hard that it never peened, it is likely that the force would simply deform something else in the gun. This wouldn’t be a solution, this would simply move the problem onto a more expensive part. It seemed to me that if the guide rod wanted to assume that beveled shape in service, that the guide rod should be made that shape in the first place. 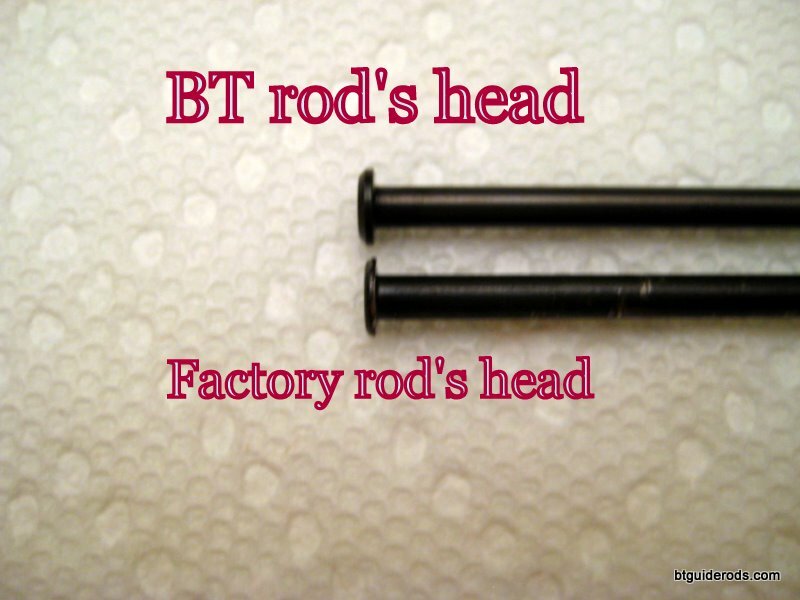 In order to ensure that it remained that way, the head of the BT replacement part is slightly longer than the factory part. This additional length puts the machined bevel out of harm’s way where it will not contact the barrel lug. Here you can see a peened factory part. This factory part has approximately 150 rounds through it. Next to it is the BT rod. Notice that the head of the BT rod is longer. 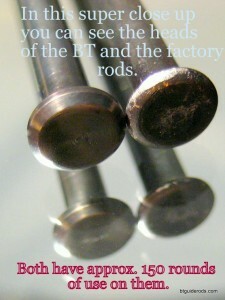 Whereas the factory part is being beaten into this shape by the gun, the BT rod starts out in this shape and is not seeing any deforming force because the additional head length keeps the bevel away from the interfering part of the gun. 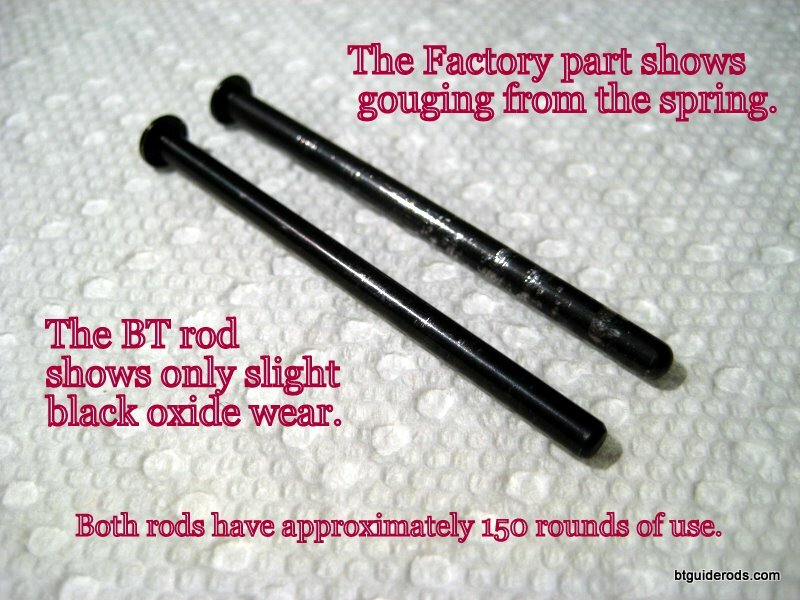 There is some slight black oxide wear visible on each, but notice that the BT rod isn’t gouged like the factory rod. The BT guide rod will stay smooth for a longer time than the factory rod, meaning a longer life of smooth cycling for your LCP. If the black oxide wears off of your BT guide rod, the stainless will never rust. Seeing is believing and we wanted to put the BT guide rod for the LCP through its paces and test it out before offering them to the public. 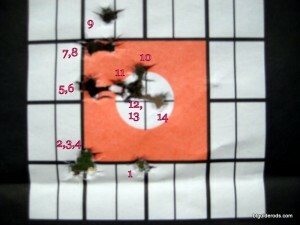 The first one was low, the next three were slightly low, left. The next two were left. It’s notable that as I was making mistakes, the mistakes were touching. 7,8,9 I was still creeping up. As I corrected and got closer to the bull the shots remained touching, going exactly where the sights were when the trigger broke. 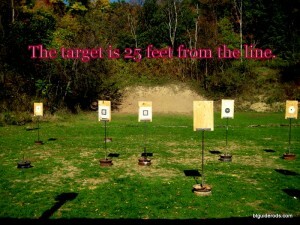 The 5 shots stacked in the bullseye were the last ones. 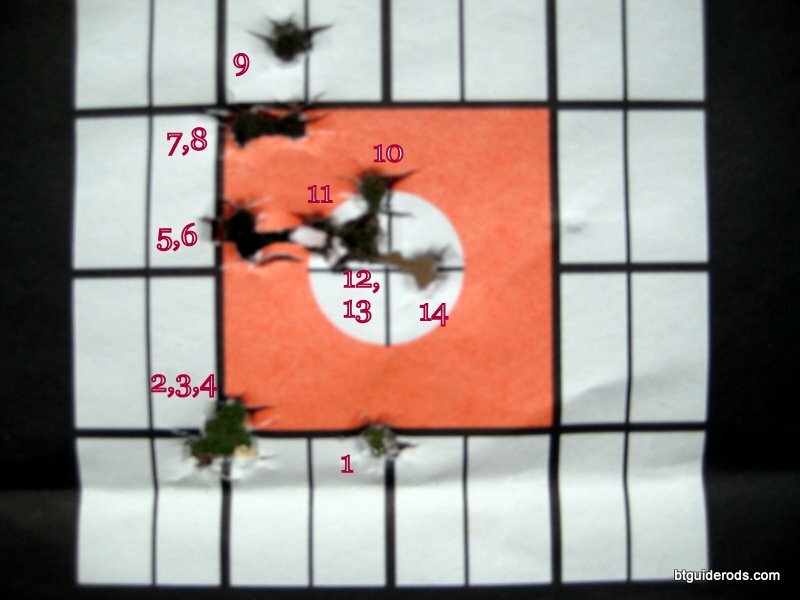 The gun always shot exactly where I pointed it and allowed me to dial it in. I was astounded at the result. To me it proves that the LCP is more than just the back-up, belly gun of last resort many claim it to be. Skillfully wielded, the LCP can consistently deliver accurate shots on target. 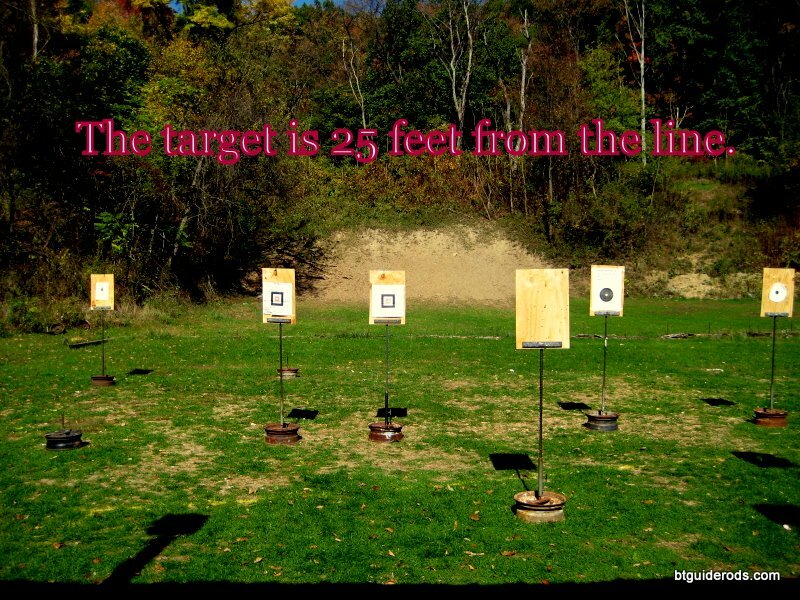 At a distance of 25 feet, this gun proved to be capable of shooting the same bullet hole!!! 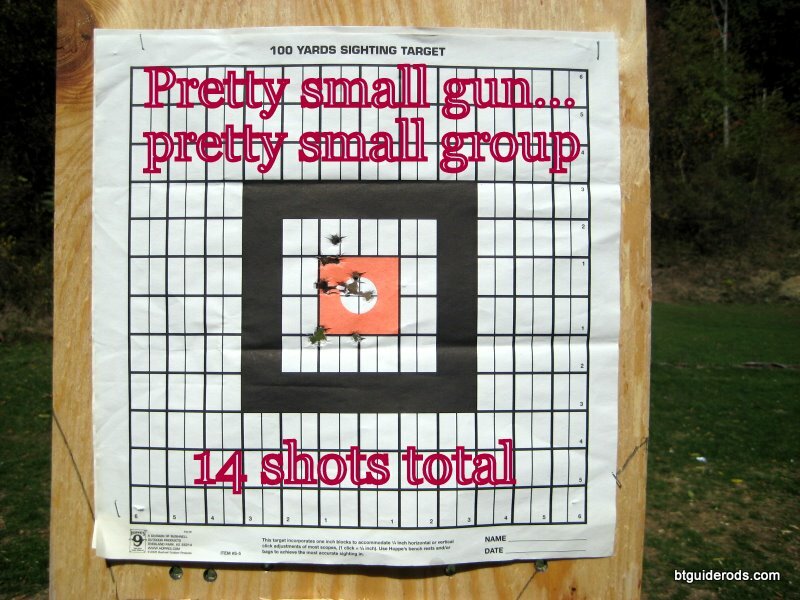 Quite an accomplishment for such a small gun, with such a short barrel, with such tiny sights and such a LOOOOOOONG trigger pull. Pick up a BT rod today and keep your pocket pistol’s guide rod in shape!